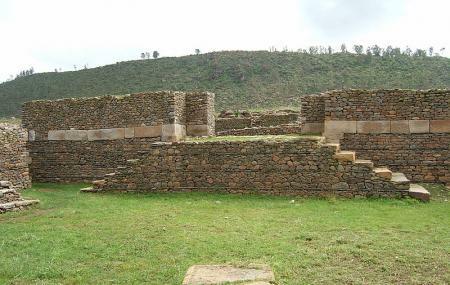 Dungur, locally and popularly known as Palace of the Queen of Sheba, is an archaeological site in Aksum. The place presents ruins of the Palace from where the Queen of Sheba ruled the Ethiopian Empire. The palace holds historical importance and is a piece of study not only for those who love history but also for those studying architecture. Though in ruins, the remains yet efficiently exhibit the complexity and magnificence of the structure. The site deserves a visit when you are in Aksum. Create a customized plan for your visit using the Aksum trip planner. You can use ready templates or start from scratch for the same. Book perfect hotels in Aksum like Hawlti Hotel, Africa Hotel, Soloda Hotel Adwa and Ethiopis Hotel. Chalk out the best way to discover the city with Aksum vacation packages. Check out various modes for how to reach Aksum. Love this? Explore the entire list of places to visit in Aksum before you plan your trip. Fancy a good night's sleep after a tiring day? Check out where to stay in Aksum and book an accommodation of your choice. If true, and it seems likely that these buildings housed something of importance & significance, then these ruins are well worth a visit. It's almost impossible to tell very much from the remains of stone walls, other than possible room sizes. But there's an atmosphere here (no, don't laugh) and perhaps it's that which convinced me this was the real thing. The stones are spread across quite an area, so the original (or redeveloped) building must have been pretty impressive, especially compared with even large traditional homes of the period. We were free to wander at will around the site. For those of limited mobility, shaded benches are available. On the othe side of the minor road which now fronts the building, are several traditional stelae, monoliths used in Ethiopia as tombstones & monuments to rulers. Fascinating. After the religious sites in town, make a quick trip to the old palace. Its an open air site just off the main road. Further along the road is the quarry where the original stella were quarried. All very interesting and a delight for photographers.